2 Responses to Be Concerned, Citizens! I’m not surprised to hear this. I’ve always had my suspicions about the people associated with this organization. I just went on http://www.sunbiz.org to verify this information and there it is in black and white. If they’ve been operating illegally then I’d like to know where everyone’s annual dues were deposited all these years. Thank you for revealing this information. 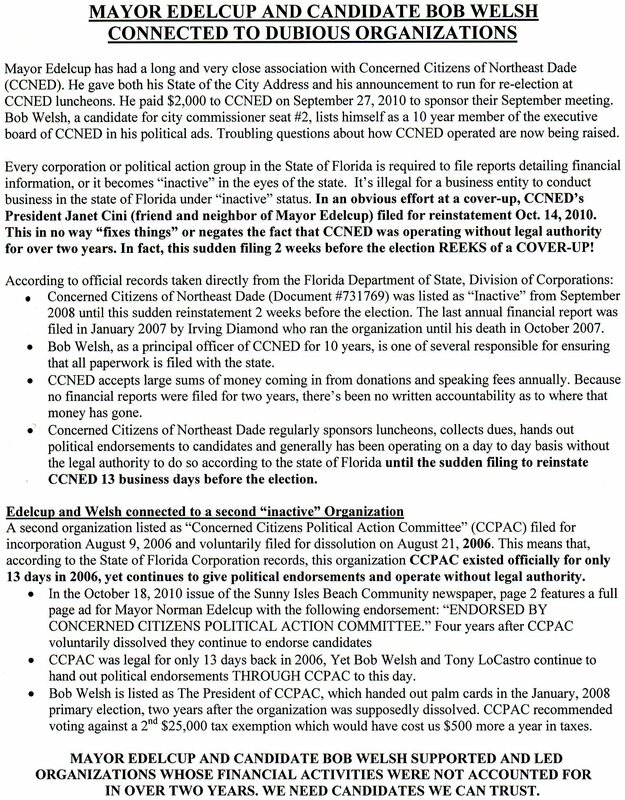 If this is how Bob Welsh manages this organization then I certainly don’t want to see him doing the same thing with SIB taxpayer dollars as a City Commissioner. We’ve had enough of this kind of shady stuff under Mayor Edelcup. We don’t need Welsh helping Edelcup operate this way for another 4 years. I heard that the mayor is planning to build a high school in Haulover Park but that he’s waiting until the election to announce it.